Most of our office staff, Northwest river guides, and River Dance Lodge staff is local to Idaho, Washington, Oregon and Montana. We donate over $15,000 a year in goods and services to various charities in northern Idaho, eastern Washington, and western Montana. Since 2008 we have been operating an annual "Raft for the Cure" which raises funds for our local chapter of Susan G. Komen for the Cure. In 2009 we started an annual "Raft to Remember" as a benefit trip for the local chapter of the Alzheimer's Association. ROW Founder Peter Grubb served 14 years on the Board of Idaho Rivers United; 13 years on the Board of the Idaho Outfitters and Guides Association; and three years on the Board of Spokane’s Center for Justice, which is home to the Spokane RiverKeeper. 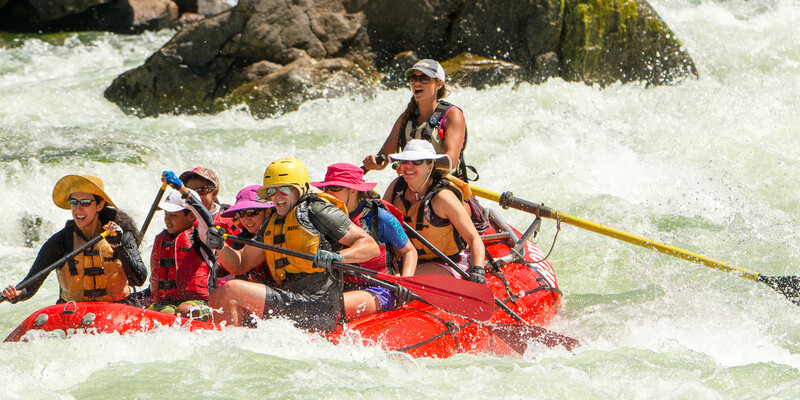 We sponsor a couple of our local Wild & Scenic Rivers film festivals, other conservation group charity events and, stay active and informed on various conservation issues. Our trips (and in fact our lives) depend on natural environments that are healthy and sustainable. Thus, one of our core values is respecting and protecting the Earth. We practice this at all levels at ROW, from our office to our field operations, where we try to minimize our footprint through wise energy use, repurposing, recycling, reducing and reusing. As well, in the field, and in our offices, we source as much of our supplies, equipment and food as locally as possible. Many of our trips involve minimal motorized travel, and are designed in order to explore a small geographic area well, rather than rushing to cover a larger area. The fact that many of our adventures are mostly human-powered (hiking, rafting, cycling, kayaking), helps in this regard. We are dedicated to maintaining the highest standards of stewardship for the environment, and the local people and cultures, in the areas where we operate. On all of our trips involving camping, we practice "Leave No Trace" techniques, and we have been since our beginning in 1979. We truly believe that by sharing the fascinating and inspiring places we visit with our guests, we have a huge opportunity, and responsibility to help create more advocates for preserving these places. In order to do our best in this regard, we conduct our own in-house training program focused on natural and cultural history interpretation. This is designed to help our guides share their knowledge in a more meaningful and relevant way to increase the likelihood that our guests will be inspired to become involved. We also provide an easy path for guest support through our River Preservation Pass Through Program. We are actively involved with, and financially support, carefully chosen conservation groups that are involved in the areas we travel. We encourage you to visit their websites to learn more about the issues they are working on, including the concern over the extinction of Idaho’s salmon. We appreciate all that our guests do to support both these organizations, and any other conservation organizations they choose. We are all in this together to protect our beautiful planet and leave it fit for generations to come! Founded in 1985, the Clark Fork Coalition is dedicated to protecting and restoring the Clark Fork River basin, a 22,000-square-mile area draining western Montana and northern Idaho. We have a 24-year-long record of substantial achievements improving the health of the watershed. The mission of American Rivers is to protect wild rivers, restore damaged rivers and conserve clean water for people and nature. We combine national advocacy with field work in key river basins to deliver the greatest impact. We’re practical problem solvers with positions informed by science. With our expertise and outreach, we work to protect and restore our nation’s rivers. Our mission is to connect, protect, and restore the wild lands, waters, native species and habitats of the Great Hells Canyon Region, ensuring a legacy of healthy ecosystems for future generations. Idaho Rivers United is a conservation organization representing all who love the freedom, adventure, and solitude of Idaho's rivers. Since its founding in 1990, IRU has become a powerful force for safeguarding Idaho's imperiled wild steelhead and salmon, protecting and enhancing stream flows and riparian areas, and defending and promoting the wild and scenic qualities of our great wild rivers. The mission of Rogue Riverkeeper is to protect and restore water quality and fish populations in the Rogue River Basin and adjacent coastal watersheds through enforcement, advocacy, field work and community action. Rogue Riverkeeper’s vision is to have fully functioning ecological, biological and hydrological aquatic ecosystems in the Rogue Basin and adjacent coastal watersheds. Save Our Wild Salmon is a nationwide coalition of conservation organizations, commercial and sport fishing associations, businesses, river groups, and taxpayer and clean energy advocates working collectively to restore healthy, sustainable wild salmon to the rivers, streams and oceans of the Pacific Salmon states.